Playwright Ruben Grijalva was recently interviewed about his new full-length play, VALUE OVER REPLACEMENT. VOR is one of four full-length plays in PlayGround’s 2014 Festival of New Works. Grijalva’s play—funny, philosophical and poignant in turns—presents Edward “Chip” Fuller, a radio sports personality and one-time major league shortstop. When baseball fans begin to realize that their heroes have been stoked with steroids, Chip is expected to denounce the drugs. Instead, he unleashes a scandal by telling a darker and more difficult truth. Grijalva earned PlayGround’s Emerging Playwright Award in 2013 for an early, ten-minute version of Value Over Replacement (Ruben is also represented in this year’s Best of PlayGround with another short play, Mr. Wong’s Goes to Washington). He’s not only a playwright and director, but also a filmmaker, with a BA in Cinema from San Francisco State and the award-winning baseball-themed short film Shadow Ball (2007) to his credit. PlayGround: Tell us about the first incarnation of this play in PlayGround's 2012/13 season. It started out as a ten-minute play inspired by the prompt “PLAY BALL.” How did you happen upon the idea of an unrepentant steroids-user? Ruben Grijalva: I grew up watching McGwire and Canseco dominate the late 1980s at the Oakland Coliseum and then spent my early twenties watching Barry Bonds from the right field knothole at AT&T Park. As it became clear what was going on with those guys, I, like many fans, went through periods of denial, disgust, and disillusionment. And then I considered: if put in the same position, would I do steroids too? I had to consider the underlying ethical and philosophical questions. What does it mean to cheat? What is fairness? What defines an achievement? Where do my efforts end and the drugs begin? Here's the lucky part: I already had the basic premise of Value Over Replacement scribbled on a notebook somewhere, but I hadn't started actually writing the play. PlayGround gave me a reason to start. PG: How was the ten-minute version received? Did you already know that this play had potential to grow into something bigger? RG: I had always intended to write a full-length play, so the question wasn't whether it could be bigger, but whether I could shrink the themes into a ten minute play. The act of squeezing a fairly big concept into ten pages helped me figure out what the play was really about. The reaction to the Monday night performance convinced me I had found an emotional core. You don't have to care about baseball or steroids to relate to Chip's situation. PG: How did the PlayGround commission process work for you? What support did you get? RG: I joined PlayGround for the deadlines. I really need that adrenaline shot of an impending deadline to do good work. There was a moment as the deadline approached when I didn't feel ready to share. Sometimes you need to have a person you don't want to disappoint, and [Artistic Director] Jim [Kleinmann] and [Associate Director] Annie [Stuart] are just the kind of people you want to show up for. And of course, once I was finished with the first act, Jim, Annie, [Director] Graham [Smith], and the cast from the table read provided some great insights that helped shape the second draft. PG: What challenges did you encounter in developing a ten-minute play into a full-length? RG: There's a temptation to try to say too much. I spun my wheels on some subplots and stylistic departures that didn't add anything. I got tangled up in all the possibilities for a while, so I put off writing and focused on research. Meanwhile, more stories about contemporary stars like Alex Rodriguez, Ryan Braun, and Melky Cabrera kept popping up, and every one of them engaged in some kind of parsing. They either claimed to be very sorry, denied the efficacy of steroids, or denied that they'd used them at all, despite extensive evidence. What I was waiting for was a guy brave enough to say, “I did it, and I'm not sorry.” If the first act is about how a generally well-intentioned person can be compelled to cheat, the second act is how they can be compelled to lie. Once I figured this out, the play found the symmetry it needed. PG: The full-length play introduces several notable new characters, including Alex, Chip's ten-year-old son, described as a "high-functioning autistic." What does Alex’s autism add to your play? RG: Alex began as a kind of device. I wanted Chip and Emily to have a son with a challenge that they are especially well positioned to deal with. But as the play developed, Alex became a real catalyst. His literal interpretation of certain ideas and his intolerance for dishonesty become driving influences. By expressing a black and white viewpoint in a very grey situation, Alex helps throws the complexity into relief. PG: Though your play is about moral choices and failings, there doesn't seem to be a villain. Did you make a conscious decision to eschew a bad guy in this story? RG: Two reasons I try not to write villains. First, I really don't think there are many true villains in the world. The vast majority of people are just doing what makes sense from their perspective. Second, I try to make each character's argument as fully and honestly as I can because the whole project of narrative is about expanding sympathy. If I can get a sense of where you're coming from, it's a lot harder to judge you. I think this is the chief virtue of fiction, drama, and cinema, at least the good stuff. It widens our circle of empathy and helps us appreciate the depth and complexity in others’ experiences. PG: What's next for "Value Over Replacement"? RG: I definitely want to work toward a full production. I'm also currently attempting to adapt the short play into a short screenplay. PG: What’s your next big writing project? RG: I feel compelled to move quickly on a feature screenplay called Great. It's an intimate portrayal of early adopters of radical life extension—the first people to reach 130, 140, 150 years of age. I am fascinated by the possibility, and how/if radically longer lives might change the way we think about life, the universe, and everything. VALUE OVER REPLACEMENT will be performed as a script-in-hand staged reading at the PlayGround Festival of New Works at Thick House (1695 18th Street, San Francisco) on Sunday, May 18 at 2pm and again on Sunday, May 25 at 12 noon. Admission is free ($15 suggested donation) and reservations are not required though encouraged. For more information on this or any of the other full-length staged readings in this year’s Festival or to reserve your tickets, visit http://playground-sf.org/festival. Ruben Grijalva earned his BA in Cinema from SFSU and helped start the fitness-entertainment company Virtual Active. Works include the award-winning short film Shadow Ball (2007), the full-length play Foresight (2010), and the short play Value Over Replacement, which featured in the Best of Playground 2013. Mary Baird can be seen in DAYLIGHTING at Shotgun Players, beginning previews May 21 and running thru June 22. Steven Westdahl and the rest of the San Francisco Neo-Futurists just won Best Theater in the SF Weekly Readers' Poll. Barely 6 months in existence and already the best. You can see why at Too Much Light Makes The Baby Go Blind every Friday and Saturday at 9pm. Michael J. Asberry performed in Fences with the Marin Theatre Company in the role of 'Gabriel' for four shows during the first week of May. Patrick Alparone is rehearsing 36 stories by Sam Shepard at Word for Word/Z Space. The show opens May 24. LA web fest awarded SanFranLand 4 awards including Outstanding Ensemble (which includes Liz Anderson and PlayGround regular Patrick Russell) and Outstanding New Comedy Series (plus awards for directing and editing). Colin Johnson designed video projections for RAT GIRL, now playing as a part of DIVAFest at the Exit Theatre, and just launched the kickstarter campaign for TERROR RAMA, a live horror/comedy anthology he's directing in October. Two members of the PlayGround Writer's Pool will have short plays staged by Wily West Productions in June. Madeleine Butler's play THE BOX and Madeline Puccioni's play THE INTERVIEW will run as part of an evening of eight short plays in the Sheherezade 14 Festival at the Exit Theater in San Francisco. The Festival has just been extended to run for all four weekends in June. Tickets are available at http://sheherezade14.bpt.me, with discounts for preview night and purchases made before May 31. For more information, visit http://www.wilywestproductions.com/sheherezade-14.html. Eric Fraisher Hayes had the first public performance of his original play Tassajara 1964 this week. Rebecca Pingree will be playing Prossy in Shaw's Candida (directed by Molly Aaronsen-Gelb), May 24 - June 14 at Town Hall Theatre of Lafayette. Ignacio Zulueta's world-premiere comedy THE FELLOWSHIP debuts June 18th at AlterTheater in San Rafael. The opening scene was written expressly for PlayGround’s October 2010 “It Gets Better” topic. Fighting for Survival and Fourteen, two short plays written by Inbal Kashtan and directed by Jon Tracy, will be part of The Fringe of Marin, May 23 - June 1, in Program 1. For lower cost tickets that are part of a fundraiser, please contact Inbal at inbalit@mindspring.com. Rachel Bublitz's one-act play Much Ado About Mathletes will be at SFSU's Fringe Festival May 13, 15, and 17, for location and more details please visit the facebook event page: http://www.facebook.com/events/1418174748440449/?ref=br_tf. Rachel is also competing this month in WRITE CLUB SF; she will be reading a new work on May 20th at 8pm at the Make Out Room in San Francisco. Additionally, Rachel's ten-minute play Baby Shower Games is being produced by Love Creek Productions at the Producer's Club in New York City on May 30, 31, and June 1. Michael Dougan’s first full-length play, Figments, has been named a semi-finalist in the 2014 Ashland New Play Festival competition. Final selections will be announced in June. 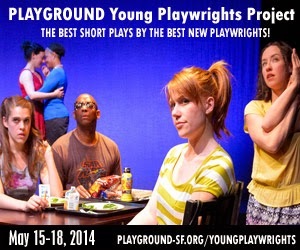 PlayGround is thrilled to announce the finalists for the 2014 Young Playwrights Contest. PlayGround invited aspiring writers and theatre artists at the high school level to write and submit their own 10-minute plays inspired by the topic: ‘All the world’s a stage, And all the men and women merely players; They have their exits and their entrances; And one man in his time plays many parts…’ (from Shakespeare’s As You Like It). The four selected plays will each receive a professional staged reading, presented as a “curtain raiser” before select performances of the 18th Best of PlayGround Festival at Thick House in May. PlayGround invites audiences to join in welcoming these bold new voices to the stage. The selected plays/ finalists are: WHO WANTS THE MOON by Eliza Mantz (Tamalpais High ’14); OCCUPI by Jake Rosenberg (JCHS of the Bay ’14); WALK A NIGHT IN MY MOCCASINS by Christine Lim (SOTA ’15); SOMNAMBULISM by Tessa King (Tamalpais High ’15). Zoe Kamil (JCHS of the Bay) was named a semi-finalist for her play, KIRU. Join us May 15-18 as we celebrate the work of these emerging young writers as a part of this year’s Best of PlayGround. 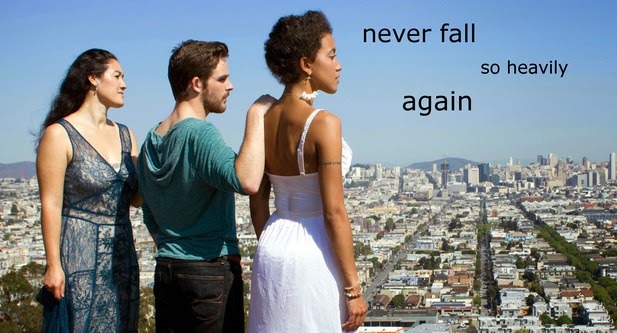 For more info, visit http://playground-sf.org/youngplaywrights. Tessa King attends Tamalpais High School. She loves reading and writing in any creative manor, especially playwriting. She hopes to write professionally in the future and travel the world while doing so. She thanks her friends and family for supporting her, as well as the CTE family. Christine Lim was born in Rangoon, Burma (Yangon, Myanmar) and arrived to San Francisco with her family when she was a year old. She is currently a junior in the Theatre program at Ruth Asawa School of the Arts. Eliza Mantz is a senior at Tamalpais High School. She is a member of the Conservatory Theatre Ensemble, where she works as an actor, designer, and director. She recently appeared as Alice in Alice: Tales of a Curious Girl. Next year, Eliza will study theatre at Harvard. Jake Rosenberg began playwriting at 16, and has already met with phenomenal success. From The 2013 Young Playwrights Contest/Best of PlayGround Festival in San Francisco to winning the Producers Club Short Play Contest in New York City, to attending New York University next fall, Jake is excited to start his career! High school students from the Bay Area nine counties were invited to submit original short scripts inspired by the assigned topic, ‘All the world’s a stage…’. The same topic was also assigned to PlayGround’s professional writers pool members for the March 17 round of Monday Night PlayGround in residence at Berkeley Rep.